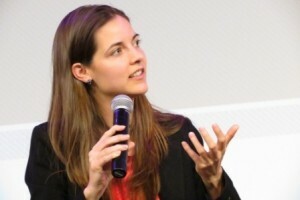 Diversifying what is considered the face of technology could encourage more women to become founders, says Kathryn Minshew, CEO and co-founder of New York career advice site The Muse and sister news site The Daily Muse. She chatted with me after speaking at last night’s Made in New York event, which promotes tech companies based in the city. “Every time there is a panel that says, ‘What’s the future of technology?’ and you see eight white dudes’ faces staring back at you, we’re taking a step back,” she says. Minshew would like to see a broader mix of leaders at conferences and other forums when they showcase innovators from the technology sector. “It is important to put women and minorities up as experts,” she says. In addition to addressing the public image of the scene, she believes more early access to computer science education could encourage more young women to embrace careers in technology. “I love what Girls Who Code is doing,” she says, referring to the organization that strives to close the gender gap in engineering and technology. She encourages educating kids in programming and computer science education and says such curriculum can be especially important for girls in middle school and high school who are making decisions about their futures. Based on her experiences, how women are presented in the technology world can inspire future generations of founders. “It would be really helpful to have more examples in the media of successful female coders,” Minshew says. She counts the smart, savvy secret agent Sydney Bristow from the television series “Alias” as one of her early role models. Rachel Sterne Haot, chief digital officer to Mayor Bloomberg. Last night Minshew talked at length about building startups in New York at Made in NY, hosted at AppNexus on West 23rd Street. Rachel Sterne Haot, the chief digital officer in Mayor Michael Bloomberg’s administration, moderated the panel that also included AppNexus president Michael Rubenstein, PublicStuff’s CTO and co-founder Vincent Polidor, and Skillshare’s CEO and co-founder Michael Karnjanaprakorn. Rubenstein said one of the challenges of being in New York, though, is the cost, which can lead some business to only open satellite offices in the city. “Companies based in other places will put a small piece of the business in New York,” he said. The actions taken by the Bloomberg administration to entice more businesses to put down stakes in the city are important, he said. Meanwhile, AppNexus, which develops platforms for digital advertising, does have its headquarters in New York, while maintaining offices in San Francisco, Seattle, Paris, London, and Tel Aviv. However, Rubenstein would like to see more effort put towards encouraging homegrown entrepreneurship over coaxing outside businesses to relocate. “I see the mayor sometimes supporting companies that are moving offices here,” he said. Michael Rubenstein and Vincent Polidor discussing the ups and downs of operating in New York. The chance to live and work in the city can be an incentive for potential hires, said Polidor. “One of the luxuries we have is being in New York,” he said. PublicStuff offers service request management and local services for small to midsize cities. Polidor would like to see more conveyor belt-style growth in the city’s technology community akin to Silicon Valley, where startups can assemble ideas and grow with an almost factory-like precision. He would also like to see more developers and shared space available for startups in New York. Having more access to such resources could help ideas evolve. PublicStuff “is trying to become a platform for developers, from individuals to huge companies,” Polidor said. “Our product allows people to provide software to governments using our technology in a quick, simple, and easy way.” As more citizens use PublicStff’s tools, he said, it demonstrates to cities that the technology is effective and useful for getting information out. Even with New York’s various perks, it can be hard for startups to resist the call of the West Coast. Karnjanaprakorn said he occasionally gets asked by investors whether he might open offices in San Francisco or Palo Alto. Minshew got her own taste of Silicon Valley in early 2012 when The Muse team was accepted into the Y Combinator accelerator. During last night’s panel discussion, she said though her company hired staff while in California, the decision was made to return to New York. In spite of access to huge companies in Silicon Valley and a deep engineering talent pool, New York offered benefits that The Muse could not resist. “Our business really depends on not being in a vacuum,” she said. The Muse’s customers, she said, include tech people, engineers, and designers, but many of its users come from such fields as finance, international development, consulting, fashion, and law. “In the Valley it was often very hard for us to get perspectives of people who were not in tech,” Minshew said. Returning to New York offered the advantage, she said, of access to more diverse industries. Still, the decision to relocate again was difficult to make. “We were told by one person in San Francisco, ‘I will finance you, but only if you stay’,” she said.